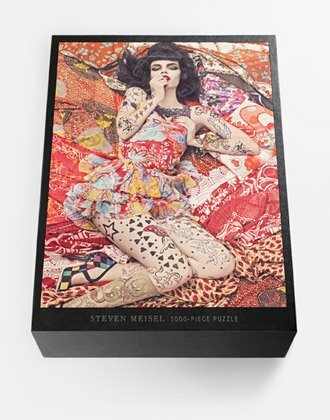 This limited-edition jigsaw puzzle features a pattern-on-pattern photograph of model Meghan Collison as a tatooed pin-up. The image originally appeared in Vogue Italia, which Meisel has created every cover and lead editorial story for nearly two decades. Each custom-made cloth box is signed and numbered by Steven Meisel. The jigsaw puzzle is manufactured by Editions Ricordi, makers of high-quality jigsaw puzzles since 1808. Puzzles are $750 each Email inquiries should be directed to: shop@artandcommerce.com. Puzzles are also available at Colette in Paris, at Barneys New York, and at 10 Corso Como in Milan.